NOTE: Requires PB-100 for programming. Answer your door or gate safetly from your home telephone. 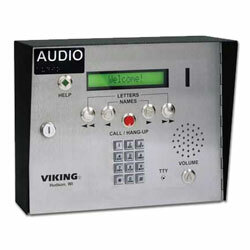 Viking Door Entry Systems provide users with safety and ease for answering the door. Whether you need a basic one door answering system, or a large apartment or office building, Viking Door Entry Systems have the perfect system for you. Provide your business or residential customers with the security and convenience of conversing with visitors from their own phone prior to allowing entry. For business, these doorboxes are designed to interface directly with the unused trunk input of a PBX or electronic key system. 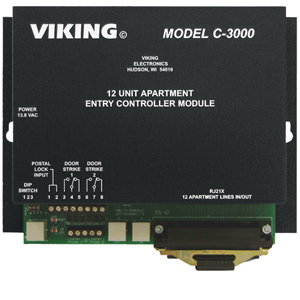 For residential applications, one or two doorboxes can share a single line phone when used with Viking's C-1000 door entry controller. The VE-5x5 is a black powder painted steel, weather resistant box designed to be surface mounted to a single gang box, a wall or a pedestal. Designed for use with W-1000/2000A/3000 Doorboxes or as a stand-alone "Dial-up" remote Touch Tone controller. These units can operate door strikes, gate openers, or control equipment at remote locations using a touch tone phone. The RC-2A Remote Controller provides remote relay operation from any standard Touch Tone telephone. For off-premise applications, the RC-2A will answer analog C.O. lines or PABX/KSU stations after a selectable ring delay. A field programmable access code can also be programmed to prevent unauthorized usage. The RC-2A will then allow remote relay operation. The RC-3 Remote Controller provides remote relay operation for up to 3 relays from any touch tone telephone. The RC-3 will answer C.O. lines or analog PABX/KSU station ports and allow remote relay operation after programmable number of rings. A field programmable security code can also be programmed to prevent unauthorized usage. Designed to address a variety of apartment entry applications, Viking C-3000 Entry System provides secure multi-tenant building access, without the need for CO lines; the only requirement is that each tenant have a touch-tone telephone set wired to their apartment. Allows you to connect 12, 24, up to 96 apartments to a front and rear K-1700-3 Entry Phone (or any touch tone phone). The K-1900-3 converts any touch tone phone into a multi-number auto dialer that will store up to 150 telephone numbers in non-volatile E2 memory. Use with Viking’s K-1700-3 or K-1900-8 phones to provide vandal resistant handsfree or handset communication. When a call initiated by the K-1900-3 is answered by an apartment or business tenant, a built-in contact closure may be activated to control electric gates or door strikes. Up to 150 keyless entry codes can also be programmed, allowing tenants to let themselves in. Multi-number dialer mode for kiosks etc. Auxilary relay input to trigger a timed relay activation for postal locks, etc. Provides 18V DC to power doorstrikes, magnetic locks, etc. The K-1700-3 is an attractive handsfree telephone designed especially for apartment and door entry applications. The K-1700-3 comes complete with a standard, flush mount, rough-in box. In addition, an optional weather resistant, surface mount box is available.